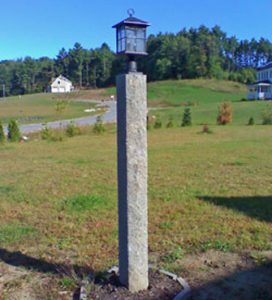 Our Rockafella posts are all manufactured in 8' lengths. They are approximately 7" X 7" square. Two opposite sides are finished smooth and emulate a thermal granite finish while the other two opposite sides are textured and emulate a rockface granite finish. 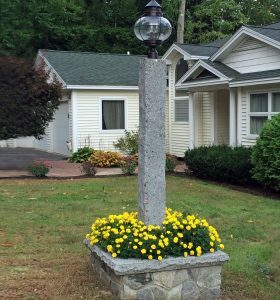 The lamp post can receive a universal attached mounting collar at the top to accept most light fixtures. This collar is available from The Step Guys. A 3/4" conduit is cast into the center of the post with a side exit below grade for easy wiring. 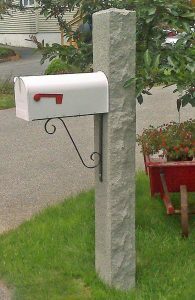 Mailbox posts come complete with a black wrought iron bracket that is installed. Mailbox is not included. 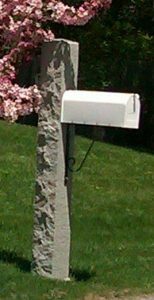 The United States Postal Service has regulations pertaining to the acceptable installation of mailboxes. Please (Click Here ) to view and print a diagram that illustrates how your post should be installed.